This entry was posted on December 5, 2013 by admin. We have two different types of cannabinoid receptor, CB1 and CB2, which are found in different locations and do different things. CB1 is mostly found on cells in the nervous system, including certain areas of the brain and the ends of nerves throughout the body, while CB2 receptors are mostly found in cells from the immune system. Because of their location in the brain, it’s thought that CB1 receptors are responsible for the infamous ‘high’ (known as psychoactive effects) resulting from using cannabis. There is no doubt that cannabinoids – both natural and synthetic – are interesting biological molecules. Hundreds of scientists around the world are investigating their potential in cancer and other diseases – as well as the harms they can cause – brought together under the blanket organisation The International Cannabinoid Research Society. Researchers first looked at the anticancer properties of cannabinoids back in the 1970s, and many hundreds of scientific papers looking at cannabinoids and cancer have been published since then. But claims that this body of preclinical research is solid “proof” that cannabis or cannabinoids can cure cancer is highly misleading to patients and their families, and builds a false picture of the state of progress in this area. Let’s take a closer look at the evidence. Virtually all the scientific research investigating whether cannabinoids can treat cancer has been done using cancer cells grown in the lab or animal models. It’s important to be cautious when extrapolating these results up to real live patients, who tend to be a lot more complex than a Petri dish or a mouse. Virtually all the research into cannabinoids and cancer so far has been done in the lab. All these effects are thought to be caused by cannabinoids locking onto the CB1 and CB2 cannabinoid receptors. It also looks like cannabinoids can exert effects on cancer cells that don’t involve cannabinoid receptors, although it isn’t yet clear exactly what’s going on there. So far, the best results in the lab or animal models have come from using a combination of highly purified THC and cannabidiol (CBD), a cannabinoid found in cannabis plants that counteracts the psychoactive effects of THC. But researchers have also found positive results using synthetic cannabinoids, such as a molecule called JWH-133. It’s not all good news though, as there’s also evidence that cannabinoids may also have undesirable effects on cancer. Furthermore, cancer cells can develop resistance to cannabinoids and start growing again, although this can be got round by blocking a certain molecular pathway in the cells known as ALK. And yet more research suggests that combining cannabinoids with other chemotherapy drugs may be a much more effective approach. 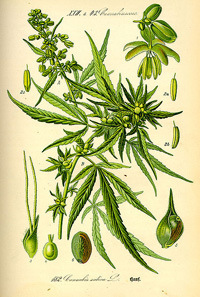 This idea is supported by lab experiments combining cannabinoids with other drugs including gemcitabine and temozolomide. But that’s the lab – what about clinical research involving people with cancer? Results have been published from only one clinical trial testing whether cannabinoids can treat cancer in patients, led by Dr Manuel Guzman and his team in Spain. Nine people with advanced, terminal glioblastoma multiforme – an aggressive brain tumour – were given highly purified THC through a tube directly into their brain. The results from this study show that THC given in this way is safe and doesn’t seem to cause significant side effects. But because this was an early stage trial, without a control group, it’s impossible to say whether THC helped to extend their lives. And while it’s certainly not a cure, the trial results suggest that cannabinoids are worth pursuing in clinical trials. There are still a lot of unanswered questions around the potential for using cannabinoids to treat cancer. The biggest issue is that there isn’t enough evidence to show that they can treat cancer in people, although research is still ongoing around the world. And it’s not clear which type of cannabinoid – either natural or synthetic – might be most effective, what kind of doses might be needed, or which types of cancer might respond best to them. So far there have been intriguing results from lab experiments with prostate, breast, lung cancer, skin, bone and pancreatic cancers, glioma brain tumours and lymphoma. But the take-home message is that different cannabinoids seem to have different effects on various cancer types, so they are far from being a ‘universal’ treatment. Most research has been focused on THC, which occurs naturally in cannabis plants, but researchers have found that different cannabinoids seem to work better or worse different types of cancer cells. Lab experiments have shown promising results with THC on brain tumour and prostate cancer cells, while CBD seems to work well on breast cancer cells. Then there’s the problem of the psychoactive effects of THC, particularly at high doses, although this can be counteracted by giving it together with CBD. Because of this problem, synthetic cannabinoids that don’t have these effects might be more useful in the long term. There are also big questions around the best way to actually get the drugs into tumours. Because of their chemical makeup, cannabinoids don’t dissolve easily in water and don’t travel very far in our tissues. This makes it hard to get them deep into a tumour, or even just deliver them into the bloodstream in consistently high enough doses to have an effect. The clinical trial led by Dr Guzman in Spain involved directly injecting cannabinoids into patients’ brains through a small tube. This isn’t an ideal method as it’s very invasive and carries a risk of infection, so researchers are investigating other delivery methods such as tablets, oil injections, mouth sprays or even microspheres. We also don’t know whether cannabinoids will help to boost or counteract the effects of chemotherapy, nor which combinations of drugs might be good to try. And there are currently no biological markers to help doctors identify who might benefit from cannabinoids and who might not – remember that one patient on the brain tumour trial failed to respond to THC at all. None of these issues are deal-breakers, but these questions need answering if there’s any hope of using cannabinoids to effectively and safely treat cancer patients. It’s worth remembering that there are hundreds of exciting potential cancer drugs being developed and tested in university, charity and industry labs all over the world – cannabinoids are merely a small part of a much larger picture. Without doing rigorous scientific research, we will never sift the ‘hits’ from the ‘misses’. If cannabinoids are ever to get into clinical use, they need to overcome these hurdles and prove they have benefits over existing cancer treatments. So that’s a brief look at cannabinoids to treat cancer. But can they stop the disease from developing? Or could they play a role in causing cancer? In experiments with mice, animals given very high doses of purified THC seemed to have a lower risk of developing cancer, and there has been some research suggesting that endocannabinoids (cannabinoids produced by the body) can suppress tumour growth. But there’s no solid scientific evidence at the moment to show that cannabinoids or cannabis can cut the risk of cancer in people. When it comes to finding out whether cannabis can cause cancer, the evidence is a lot murkier. This is mainly because most people who use cannabis smoke it mixed with tobacco, a substance that definitely does cause cancer. This complex issue recently hit the headlines when the British Lung Foundation released a study suggesting that the cancer risks of cannabis had been underestimated, although this has been questioned by some experts including Professor David Nutt. Although there’s a lack of data showing that cannabinoids can effectively treat cancer, there is good evidence that these molecules may be beneficial in other ways. As far back as the 1980s, cannabinoid-based drugs – including dronabinol (synthetic THC) and nabilone – were used to help reduce nausea and vomiting caused by chemotherapy. But there are now safer and more effective alternatives and cannabinoids tend to only be used where other approaches fail. In some parts of the world – including the Netherlands – medical use of marijuana has been legalised for palliative use (relieving pain and symptoms), including cancer pain. For example, Dutch patients can obtain standardised, medicinal-grade cannabis from their doctor, and medicinal cannabis is available in many states in the US. But one of the problems of using herbal cannabis is about dosage – smoking it or taking it in the form of tea often provides a variable dose, which may make it difficult for patients to monitor their intake. So researchers are turning to alternative dosing methods, such as mouth sprays, which deliver a reliable and regulated dose. Large-scale clinical trials are currently running in the UK testing whether a mouth spray called Sativex (nabiximols) – a highly purified pharmaceutical-grade extract of cannabis containing THC and CDB – can help to control severe cancer pain that doesn’t respond to other drugs. There may also be potential for the use of cannabinoids in combating the loss of appetite and wasting experienced by some people with cancer, although a clinical trial comparing appetite in groups of cancer patients given cannabis extract, THC and a placebo didn’t find a difference between the treatments. We want to see safe, reliable and effective treatments become available for patients as quickly as possible. We receive no government funding for our research, and it is all paid for by the generosity of the public. This is obviously not a bottomless purse, and we do not have financial reserves to draw on. Because of this limitation, we can only fund the very best research proposals that come to us that will bring benefits to people with cancer. We’ve previously written in detail about how we fund research projects. Cancer Research UK has funded research into cannabinoids, notably the work of Professor Chris Paraskeva in Bristol investigating the properties of cannabinoids as part of his research into the prevention and treatment of bowel cancer. He has published a number of papers detailing lab experiments looking at endocannabinoids as well as THC, and written an interesting review looking at the potential of cannabinoids for treating bowel cancer. Our funding committees have previously received other applications from researchers who want to investigate cannabinoids that have failed to reach our high standards for funding. If we receive future proposals that do meet these stringent requirements, then there is no reason why they would not be funded – assuming we have the money available to do so. There’s no doubt that the natural world is a treasure trove of biologically useful compounds. But whole plants or other organisms are a complex mix of hundreds of chemicals (not all of which may be beneficial) and contains low or variable levels of active ingredients. This makes it difficult to give accurate doses and runs the risk of toxic side effects. For example, foxgloves (Digitalis) are a useful source of chemicals called cardiac glycosides, first purified in 1785 – a date widely considered to be the beginning of modern drug-based medicine. These drugs are now used to treat many thousands of people around the world with heart failure and other cardiac problems. But the entire plant itself is highly toxic, and eating just a small amount can kill. As another example, although the antibiotic penicillin was first discovered in a fungus, it doesn’t mean that someone should munch some mould when suffering an infection. In fact, the bug-beating powers of ‘natural’ penicillin are confined to a relatively small range of bacteria, and chemists have subsequently developed a wider range of life-saving antibiotics based on the drug’s structure. Aspirin is another old drug, first discovered in the form of salicylic acid in white willow bark. But this naturally-occurring chemical causes severe stomach irritation, which led to the German company Bayer developing an alternative version – acetylsalicylic acid – which was kinder to the tummy. Aspirin is now arguably one of the most successful drugs of all time, and is still being investigated for its potential in preventing or even treating cancer. Numerous potent cancer drugs have also been developed in this way – purifying a natural compound then improving it and testing it to create a beneficial drug – including taxol (originally from yew leaves); vincristine and vinblastine (from rosy periwinkles); camptothecin (from the Chinese Xi Shu tree); colchicine (from crocuses); and etoposide (from the May Apple). And we recently wrote about a clinical trial being run by our scientists to test whether curcumin, a purified chemical from the curry spice turmeric, could help treat people with advanced bowel cancer. But it bears repeating that the fact that these purified drugs in controlled, high doses can treat cancer doesn’t mean that the original plant (or a simple extract) will have the same effect. So although cannabis contains certain cannabinoids, it doesn’t automatically follow that cannabis itself can treat cancer. As we said above, there is no good evidence that natural cannabinoids, at the doses present in simple cannabis preparations, can treat cancer in patients. It’s also completely unknown whether there may be any other chemicals in ‘street’ cannabis extracts that could be harmful to patients or even encourage tumour growth. There is a strong and persistent presence on the internet arguing that cannabis can cure cancer. For example, there are numerous videos and unverified anecdotes claiming that people have been completely cured of cancer with cannabis, hemp/cannabis oil or other cannabis derivatives. YouTube videos are not scientific evidence. Despite what the supporters of these sources may claim, videos and stories are not scientific evidence for the effectiveness of any cancer treatment. Extraordinary claims require extraordinary evidence – YouTube videos are emphatically not scientific evidence, and we are not convinced by them. Based on the arguments presented on these kinds of websites, it’s impossible to tell whether these patients have been ‘cured’ by cannabis or not. We know nothing about their medical diagnosis, stage of disease or outlook. We don’t know what other cancer treatments they had. We don’t know about the chemical composition of the treatment they got. And we only hear about the success stories – what about the people who have tried cannabis and not been cured? People who make these bold claims for cannabis only pick their best cases, without presenting the full picture. This highlights the importance of publishing data from scientifically rigorous lab research and clinical trials. Firstly because conducting proper clinical studies enables researchers to prove that a prospective cancer treatment is safe and effective. And secondly because publishing this data allows doctors around the world to judge for themselves and use it for the benefit of their patients. This is the standard to which all cancer treatments are held, and it’s one that cannabinoids should be held to too. Internet anecdotes and videos prove nothing and benefit no-one – we need reliable, scientific research, which (as discussed above) is exactly what is going on. As we’ve previously said, accusations that we are somehow part of a global conspiracy to suppress cancer cures are as absurd as they are offensive. Not only to the thousands of our scientists, doctors and nurses who are working as hard as they can to find more effective treatments for the complex set of challenging diseases we call cancer, but also the hundreds of thousands of people in the UK and beyond who support this life-saving work through generous donations of money, energy and time. Our aim is to beat cancer, and we believe that the best way to do this through rigorous scientific research aimed at understanding cancer on a biological level and working out how to prevent, detect and treat it more effectively. This approach has helped to change the face of cancer prevention, diagnosis, treatment, leading to a doubling in survival rates over the past 40 years. As a research-based organisation, we want to see reliable scientific evidence to support claims made about any cancer treatment, be it conventional or alternative. The claims made for many alternative cancer therapies still require solid evidence to support them, and it often turns out that these ‘miracle cures’ simply don’t work when they’re put to the test. This doesn’t mean there’s a conspiracy to suppress the “True Cure for Cancer” – it means that doctors and researchers want to see solid evidence that the claims made by people peddling these treatments are true. This is vital because lives are at stake. Some people may think that a cancer patient has nothing to lose by trying an alternative treatment, but there are big risks. If someone chooses to reject conventional cancer treatment in favour of unproven alternatives, including cannabis, they may miss out on treatment that could save or significantly lengthen their life. They may also miss out on effective symptom relief to control their pain and suffering, or the chance to spend precious time with their loved ones. Furthermore, many of these unproven therapies come at a high price, and are not covered by the NHS or medical insurance. And, in the worst cases, an alternative therapy may even hasten death. Although centuries of human experimentation tells us that naturally-occurring cannabinoids are broadly safe, they are not without risks. They can increase the heart rate, which may cause problems for patients with pre-existing or undiagnosed heart conditions. They can also interact with other drugs in the body, including antidepressants and antihistamines. And they may also affect how the body processes certain chemotherapy drugs, which could cause serious side effects. There is also a reported case where a Dutch lung cancer patient took cannabis extract that had been bought from a street source. Within a matter of hours she was in hospital in a coma. This highlights the risks of taking ‘street’ cannabis extracts of unknown concentration and quality in an uncontrolled way, and accentuates the need for careful research into how best to use cannabinoids for treating patients. It is a sad fact that although huge progress has been made over recent years, many thousands of people in the UK lose their lives to cancer every year – a situation that we urgently want to change through research. But when conventional treatment fails, there is little chance that turning to an unproven alternative touted on the internet will provide a cure. In this situation, we recommend that cancer patients talk to their doctor about clinical trials that they may be able to join, giving them access to new drugs and providing valuable data that will help other sufferers in future. Some people argue that the potential of cannabinoids is being ignored by pharmaceutical companies, because they can’t patent the chemicals occurring in cannabis plants. But pharma companies are not stupid, and they are quick to jump on promising avenues for effective therapies. As we’ve shown, there are hundreds of researchers around the world investigating cannabinoids, in both private and public institutions. And there are many ways that these compounds can be patented – for example, by developing more effective synthetic compounds or better ways to deliver them. On the flip side, other people argue that patients should be treated with ‘street’ or homegrown cannabis preparations, and that the research being done by companies and other organisations is solely to make money and prevent patients accessing “The Cure”. This is also a false and misleading argument, analogous to suggesting that patients in pain should buy heroin or grow opium poppies rather than being prescribed morphine by a doctor. The best way to ensure that the benefits of cannabinoids – whether natural or synthetic – are brought to patients is through proper research using quality-controlled, safe, legal, pharmaceutical grade preparations containing known dosages of the drugs. To do this requires time, effort and money, which may come from companies or independent organisations such as charities or governments. And, ultimately, this investment needs to be paid back by sales of a safe, effective new drug. We are well aware of the issues around drug pricing and availability – for example, the recent situations with abiraterone and vemurafenib – and we are pushing for companies to make new treatments available at a fair price. We would also hope that if any cannabinoids are shown to be safe and effective enough to make it to the clinic, they would be available at a fair price for all patients that might benefit from them. As things currently stand, cannabis is classified as a class B drug in the UK, meaning that it is illegal to possess or supply it. It is not for Cancer Research UK to comment on the legal status of cannabis, its use or abuse as a recreational drug, or its medical use in any other diseases. But we are supportive of properly conducted scientific research that could benefit cancer patients. As a research-based organisation, we continue to watch the progress of scientists around the world for advances that may benefit people with cancer. As a research-based organisation, we continue to watch the progress of scientists around the world for advances that may benefit people with cancer. And although cannabinoid research is an interesting avenue, it’s certainly not the only one. Note: We’ve already entered into two lengthy, time-consuming and ultimately circular debates about cannabis, cannabinoids and cancer which you can read here and here. Finally, we are grateful to Dr Manuel Guzman (Complutense University, Madrid), Professor Vincenzo di Marzo (Institute of Biomolecular Chemistry, Naples, and GW Pharmaceuticals) and Dr Wai Liu (St George’s Hospital, London) for helpful discussions as we were writing this post. CancerHelp UK – Does smoking cannabis cause cancer? CancerHelp UK – Is cannabis a treatment for brain tumours? Hall, W., Christie, M. & Currow, D. (2005). Cannabinoids and cancer: causation, remediation, and palliation, The Lancet Oncology, 6 (1) 42. DOI: 10.1016/S1470-2045(04)01711-5.